Sampaguita talks about what it takes to become a Pinoy rock legend. Known as the queen of Pinoy rock, Sampaguita continues to perform her classic songs from the ‘70s and ‘80s until today. As a special guest in the upcoming OPM musical retrospect Yugyugan Nation, the legendary female rocker admits she feels lucky to be the lone female performer in the concert which also features members of OPM groups like VST & Company, Boyfriends, Labuyo, Abrakadabra, and Hagibis. "It’s always very nice, always very spoiled (laughs). I’m always enjoying myself. I’m excited to be part of them kasi hindi naman ako disco or that sound, rock ako eh. Litaw ako so I’m very happy and very humbled na kinuha pa ako nila. Isinali, ganun,” she shared during the Yugyugan Nation presscon held last October 25 at Resorts World Manila in Pasay city. The OPM performer admitted she sees many with potential in the younger generation of Pinay singers today. But Sampaguita said she has yet to see anyone who can do justice to a remake of her classic song “Nosi Balasi.” " I think they’re all good. I think you have to be the right person at the right time, lahat yan it has to help eh. Not just because magaling ka or beautiful ka, kailangan yung synchronicity. Pag nag-align yung mga planets lalabas din yung isa pang ganun. Pero walang kasing baliw pa akong nakikita (laughs). There’s a lot but I have not been exposed to seeing them and I think marami. But they’re not promoting rock eh. That’s why mahirap. But whoeever has the heart and soul, yung hindi siya costume, yung kung sino talaga siya. Hindi yung porke kakanta ka ng Sampaguita o Mike Hanopol tapos iko-costume mo. Kung nasa puso mo yun and you feel it then you are it. For me, they can mold you into somebody pero kung hindi ikaw yan, the people will be the one judging kung bagay,” she admitted. Among the current crop singers, it is Pinoy Band Superstar judge Yeng Constantino’s style that has been likened most to her. Sampaguita has some words of advice for the younger singer. "This is my message. Do your thing. Don’t let anybody kind of box you in. If you want to rock then rock. That’s it. And I think Yeng or whoever, rock and roll na. Hindi puwede yung isang chorus line lang. Get a band, have a band in the back, drummer, gitarista at yugyugan na. Hindi puwede yung parang laging nasa chorus lang. Get a band behind them and rock it out,” she said. The Yugyugan Nation performer also admitted she would love to see Pinoy 70s music make a comeback in the industry. "Yes bakit hindi? Kasi ang rock para sa atin yan eh. Hindi puwede yung martir, yung mga iiyak iyak. No way. Rock is steady. It’s solid. I would like that sana,” she admits. 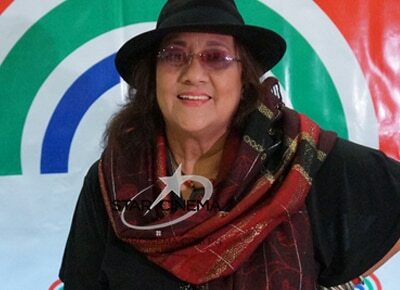 After retiring from regular performances, Sampaguita said she has kept herself busy with her family and her other passions. "I do a lot of things. I make perfumes. I sell antiques. I make throw pillows. I’m into everything,” she added. With their OPM musical geared towards the older set, Sampaguita has a message for millennials who are also interested in watching their concert. "Please come over because this is the time that music was in its golden years and if you love your parents, uncles, aunties, lolos, lolas, then love their music. We are their music,” she said. The all-star reunion concert Yugyugan Nation will be held on November 23, 8pm at the Newport Performing Arts Theater and is directed by master concert director Freddie Santos. Yugyugan Nation is presented by Resorts World Manila and Ultimate Shows, Inc. For tickets, please call 908-8000 local 7700 or 891-9999 for more information.